Sony's given its handheld a number of design tweaks, but can it survive in an ever-crowded market? Aside from that high asking price, the Vita Slim is a great handheld especially worth a look at if you're already a PS4 gamer. 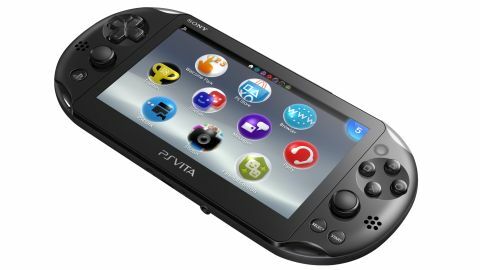 Update: We're long way from the 2012 release of the original PS Vita console, which was Sony's successor to the highly popular PSP (PlayStation Portable) handheld. Last year was full of bad news for the ageing handheld console, with Sony gearing up to remove PS Vita titles from their monthly lineup of free PS Plus games, while production of the PS Vita console is shutting up shop for good this year. You can still nab a console here and there – just check out our page for the best PS Vita deals – while the past few years has spawned some incredible portable titles, as seen in our list of the 8 best PS Vita games. Sony is making a bold play with the PS Vita Slim. The dedicated handheld market is one that's vanishing, yet Sony is willing to bet its latest portable on it. And with a £180 RRP (around US$290, AU$330), the PS Vita Slim is asking for more faith (and money) than its rivals. But if you're out for a solid handheld and have the cash to splash, the good news is that you'll be getting a superb handheld console. Thinner, lighter, but just as powerful as the 2012 PS Vita, the PS Vita Slim does a lot right. Sony has made some subtle changes, both internally and externally, but they're mostly welcome improvements. The design tweaks make for a more portable, comfortable system, although it does come at the expense of the OLED screen which has now been replaced with an LCD. The PS Vita Slim is coming to the UK on February 7, and the US on May 6 (2014). But while the PS Vita Slim arrived in Japan with an array of vibrant colour options, Brits will only be getting their hands on the black, Wi-Fi-only model for the time being. On the face, the differences in the PS Vita Slim are subtle. Put it next to the Vita original however, and you'll begin to appreciate the changes that Sony has made. The console is around 20% slimmer (about 3mm) than the original, bringing it down to 15mm. It's also 42g lighter, which is the most immediately noticeable thing when you pick the Vita Slim up. Those might not sound like dramatic changes but they'll be pleasing for hands familiar with the original model, which was a tad on the bulky side. One of the most significant changes with the Slim is the screen. While Sony is keeping the display at 5 inches with the same 960 x 544 resolution, it's switching the OLED panel for an LCD - a sacrifice it had to make for that slimmer body. That sounds like bad news but with the pixel density sticking at 220ppi, the difference isn't as drastic as you might expect. The picture is still sharp and it's certainly not something that will bother anyone picking this up as their first Vita handheld. However, for those of you with the current Vita, the colours on the Slim's display are noticeably less vibrant, while viewing angles are reduced as a result of the step-down. Put the two side by side and I did notice that the colours looked a little more washed out on the Slim compared to the highly-vivid tones on the Vita original. The screen also now has a seam around it, which breaks the consistency of the original's design. On the plus side, the LCD means a longer battery and a cheaper price than the launch price of the Vita original. On the top of the Vita Slim, Sony has moved the game slot to the centre and put in two LEDs - one for power, one for Bluetooth - on the left. Flip the Slim on its head and you'll also notice that the charging port has also been changed. Sony has switched the charger port for a micro USB port, which should be only good news. If you have an Android phone then the chances are that you own a Vita Slim charger already. The headphone socket and memory card slot also sit on the underside. In fact, the only thing completely missing from the Vita in its second iteration is that slightly-mysterious accessory port which sat on the top. As Sony never actually released anything for this, it clearly decided that it made more sense to cut it completely. All these things considered, the Vita Slim definitely has a tidier look to it. As for the controls, very little has changed here. The analogue sticks sit in the same place and at the same size, while the D-pad and shoulder buttons are also identical. Sony has, however, made the Home, Start and Select buttons round and much easier to press on the Slim. The back touch panel is also still present, although it's a tad smaller than the previous time we saw it given the overall size reductions of the handheld. But despite its slimmer form, you still won't be able to slip the Vita into your pocket easily as you would some of its rivals (iPhone, 3DS), so you'll likely want to invest in a carry case of some sort. Not only for that, but because the Vita has a nasty habit of picking up scratches and fingerprints. Don't say we didn't warn you - buy protection on day one.